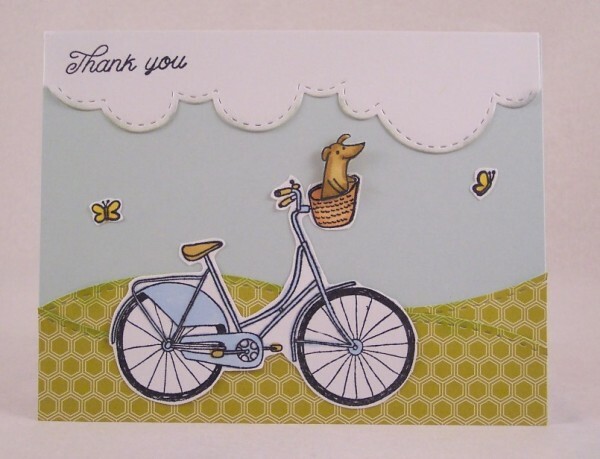 For my first card I used the fun new Basket Case stamp set. 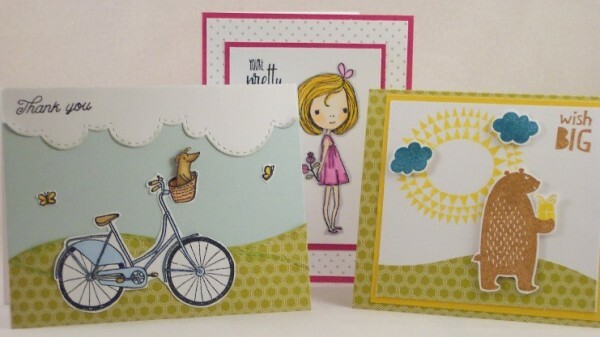 This set includes a bicycle with a basket along with flowers and an adorable dog to put in the basket as well as several phrases. I paired it with the Landscape Die Set which includes clouds and three hill shapes with a stitched edge accent all of which are all the same length as a standard card size (5 1/2″). I think this die set is one I’m going to be using a lot to create cute scenes with! The green paper I used for the hills is from the Petite Hexagon Cardstock. Next I used one of the sweet girls from the the Girlfriends set, this set has three girls, some of the cutest little dogs and hearts. I added flowers from the Basket Case set behind her back and the words are from that same set too. The paper is from the Reverse Polka Dot Cardstock. Isn’t she cute? Lastly I used the Hoory stamp set, this is such a happy cheerful set. It includes this great bear along with items for him to hold like a balloon, present and berries. There’s also cool sayings, clouds, a big sun and a banner. 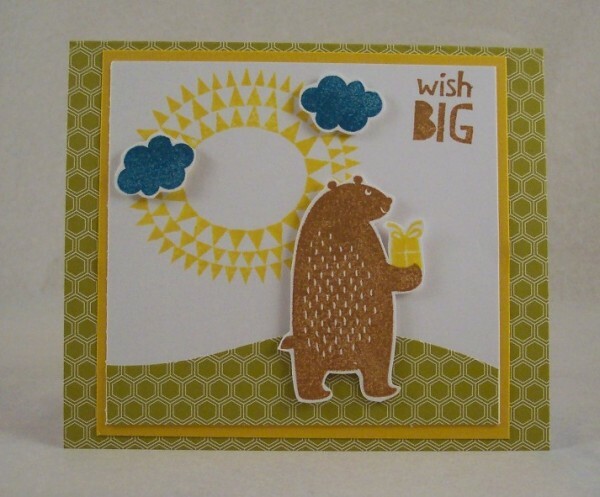 I again used the hill die from the Landscape die set and paper from Petite Hexagon. 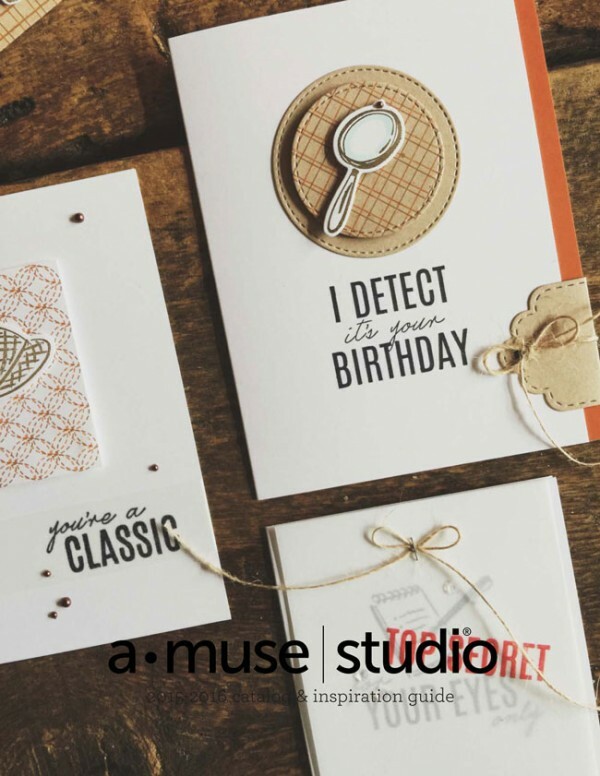 All these fabulous new products are available right now from A Muse Studio, you can shop on-line here at their website or contact your local consultant to order or host a party. And be sure to check back tomorrow when we’ll be hosting an A Muse giveaway!! And I’ll have more samples in the coming weeks too. Thanks for the great Amuse Studio cards! Love them all! Really cute samples!!!!! Love the Landscape Die Set. So versatile! This is a new company for me. I could not find a place on website to request a consultant. It keep asking for her name. Love the cards that you came up with! Will have to share your post with my stamp club.